I’ll admit, I am not too picky about my apps. As long as they are efficient, and make sense from a UI perspective, I can deal with other nuances that others may be pickier about. That being said I really like the app that came along with the announcement. The Teams App is compatible with Windows 7 or later operating systems as well as Mac OS X (I am not sure of the version sorry). For the tablet and Smart Phone users out there, you can download Windows Teams for your handhelds if running Android 4.4 or later, iOS 9.0 or later and Windows Mobile 10. In order to install these apps or even sign in to teams you require the following O365 license: Business Essentials, Business Premium, El, E3, and E5. Keep in mind, teams is still in preview mode. I have already seen a number of colleagues on social media talk about moving off of Slack into Teams, but you should be aware that it won’t be officially released until next year. I am going to discuss the Windows 10 and iOS versions of the app today. My own phone is a Windows Phone, but is version 8.1 so I can’t install at this time. However, I also have an iPad so I have installed it there. I’ll discuss the Windows App first, but to be honest the layout is very similar. Chat: This is for direct chat with yourself, not the general conversations happening in the channels. Teams: This is a list of teams you have access to or are connected to as well as any channels within those teams. You can see in my screenshot below I have one team called Joint Presentation – Find… and have a single channel titled general. Files: List of files added to your teams and recently to sites you have access to (see the integration with SharePoint?). The iOS app in my opinion is pretty basic. When loading you are presented with the recent activity of the Teams you are involved with. Posts, file uploads and other activities within Teams is all listed here. 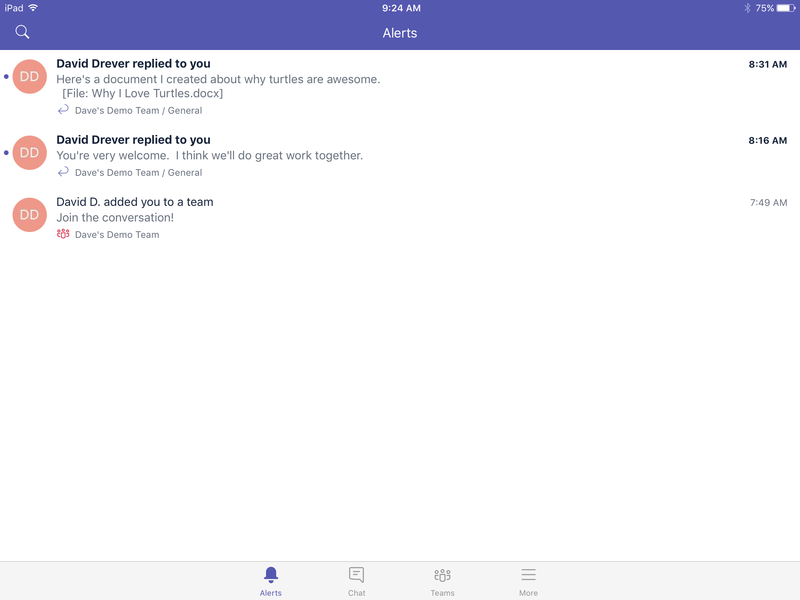 Along the bottom of the screen you have the option for Alerts, Chat, Teams, and a More button. More takes you to your profile where you can change your settings, view your own activity and your saved\tagged conversations. I personally do not find the look and field as nice as the Windows App, but it is functional. That’s the gist of the apps you get for Teams. I would have gone into more detail, but I intend to do that soon while discussing the different features and how to use them in future posts of this series. 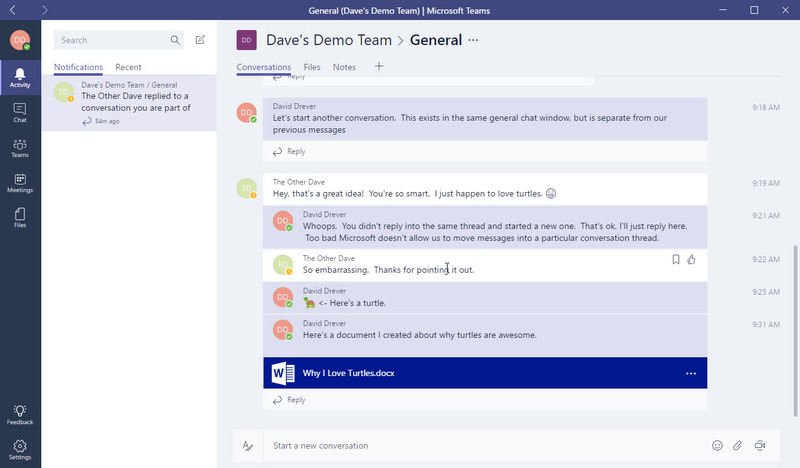 Next on the list I am going to provide some detailed information on the chat feature within Teams. I really like the chat feature and am looking forward to discussing it.